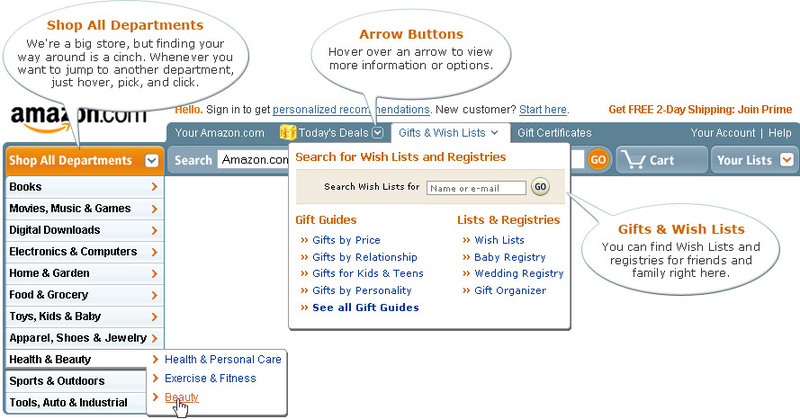 Amazon was an early user of dHTML techniques, and one of the first mega-sites to do inline popups and such (See All Categories). The new design takes this to the next level with many more menus that popup when you mouseover them. Since Amazon has so many products these days, it must be a nightmare to try to fit things in, in a way that people find them easily. I personally just use search with the one exception of browsing “what’s new”. Interestingly, I went there to check it out in Firefox 2.0.0.7 (MacBook Pro), and the new design didn’t show up. Some of the widgets (like the carousel) did, but the rest of the layout was the old tabbed layout of yore. However, I loaded the site up in Safari 2.0.4, and the new design was in place over there. Does this foreshadow a new trend, where Webkit and IE are being targeted first, or do their servers randomly send incoming users to one design or the other (perhaps the new design hasn’t propagated across all clusters?)? I wrote a UX review of the changes a few days ago. I didn’t think it was much of an improvement. @Jason: I think they are doing the rollout as a split A/B test. So clear your cache and refresh. You might get it. I heard they run hundreds of A/B tests every day testing layout elements and seeing how people respond.. from one moment to the next you may have a slightly different Amazon. To get the beta test, just keep clearing your cookies and reloading the homepage. It’s appears to be based on session ID. In fact, even if you get the beta test and then log into your account, that’s no guarantee that you’ll continue to see the beta when you log into the same account from another machine or browser.